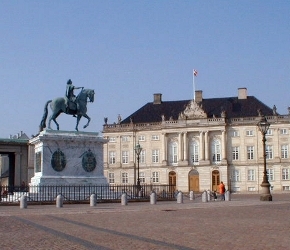 Four identical palaces surrounding the octagon square comprises the Amalienborg complex and the Royal residences from 1750 - with the equestrian statue of King Frederik V in the centre. Amalienborg Palaces - 1750 -1758. The Amalienborg Palace Complex consists of four rococo palaces from 1750-1758 - and is the prime residence of the Danish Royal family. The palace buildings are placed around an octagonal square with a equestrian statue of King Frederik V (1723-1766 - ruled Denmark and Norway 1746-1766) in the centre - who was the planner and builder of Frederiksstad in 1748 - where the Amalienborg palaces area part of. The land around Amalienborg Palaces was acquired about 1602 by King Christian IV (1577-1648 - ruled Denmark and Norway 1588-1648) and was located outside the ramparts of Copenhagen. King Christian IV - who was also known as the great architect and builder of Copenhagen used other parts of the obtained land to expand the city by building Rosenborg Castle (1606-24) – Nyboder quarters - and residence for the royal navy (1631-41) - The Citadel - a fortification to protect the city against attacks from the Sound (1624). 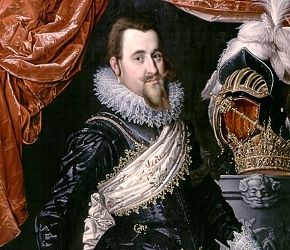 It was King Christian IV, who acquired the land in 1602 - which was later used for building the future Amalienborg Palaces. The King's plan was to spread out the city outside the ramparts of Copenhagen with many of his other impressive building projects like Rosenborg Castle - Nyboder Quarters and the Citadel at the Sound. The Citadel from 1624 was one of the larger projects of King Christian IV - and established on the land he had obtain in 1602 to develop the city. The Citadel was built to secure the Northern entrance to the harbour of Copenhagen and was placed towards the Sound. The Citadel and old fortress is open for visitors all year round. The first palace on the area at the waterfront, where the present Amalienborg palace is placed was called Sophie Amalienborg and built between 1669-1673 by Queen Sophie Amalie (1628-1685) - who was consort to King Frederik III (1609-1670 - ruled Denmark and Norway 1648-1670). Sophie Amalienborg palace was raised by a fire in 1689 and burnt down to the ground with many casualties. The Queen died in 1685 at Sophie Amalienborg palace - and just a few years before her castle was demolished. The first palace on the grounds where the present Amalienborg Palaces are situated was Sophie Amalienborg from 1669 built by Queen Sophie Amalie. 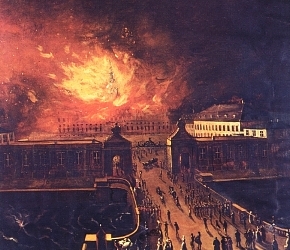 The palace burnt down to the ground in 1689 and the painting is from 1740. 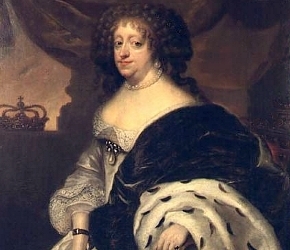 Painting of Queen Sophie Amalie around 1678 by Abraham Wuchters. The Queen was consort of King Frederik III - who introduced the absolute monarchy in 1660. She lived at Sophie Amalienborg Palace for 15 years after she was widowed. The second royal estate on the Amalienborg premises was built by King Frederik IV (1671-1730 - ruled Denmark and Norway 1699-1730) at the beginning of his reign. It was a small modest summer residence for the royal family in two stories with a view over the harbor area and surrounded by a French-style garden. The summer residence was also called Sophie Amalienborg and later excavated to give place for the ambitious - and impressive plans of King Frederik V (1723-1766 - ruled Denmark and Norway 1746-1766) to establish a fashionable district outside the city walls of Copenhagen. The second Sophie Amalienborg was built by King Frederik IV in 1672 on the same premises as the first Sophie Amalienborg. The property was a small modest summer residence surrounded by a French-style garden with a central pavilion and arcades on both sides. King Frederik V was the grand architect behind the new suburban area called Frederiksstad and the founder of the Amalienborg complex. The plan was to establish a fashionable district and homes for nobilities. The portrait is painted by Carl Gustav Pilo in 1751. King Frederik V selected the grounds of the two former royal Amalienborg estates to be the centre of his new building project, which was a prominent district - called Frederiksstad (Frederik’s City) in Baroque style and mainly with exclusive homes for aristocrats and noble families. Later the construction of buildings was created in rococo architecture and supplanted by the neoclassic style. The new district Frederiksstad was also built by the King to commemorate in 1748 the tercentenary of the Oldenburg dynasties ascent to the Danish throne and in 1749 to celebrate the tercentenary of the coronation of the first Oldenburg King Christian I (1426-1481) - ruled Sweden 1457-1464 and Denmark and Norway 1448-1481). King Frederik V was the planner of a new exclusive district called Frederiksstad, with the impressive Marble Church as a prestigious landmark and the four Amalienborg Palaces to be the centre point of the fashionable town quarters. Frederiksstad was built on the former grounds of two other palaces named Sophie Amalienborg, and the new suburban area for nobilities was developed by the King’s leading court architect Nicolai Eigtved. The new district Frederiksstad was also built as a prominent monument by the King to commemorate the tercentenary in 1748 of the Oldenburg dynasties ascent to the Danish throne as well as to celebrate in 1749 the tercentenary of the coronation of the first Oldenburg King Christian I. 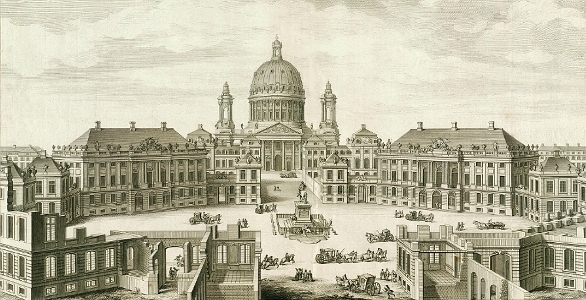 The illustration is from 1756 showing the entire Frederiksstad complex and Amalienborg Palaces. According to the master plans for Frederiksstad developed by the King’s leading court architect Nicolai Eigtved - the major project was composed of four mansions to house four distinguished families of nobility from the royal circles. The building plots by the harbour were donated by the King to the chosen families - and the only conditions were that the stately manors should be identically built and placed around the octagonal square that was a part of the so called Frederiksstad axis - which went through the Amalienborg complex and quarters. The short axis went from the Marble Church (Frederikskirke) through Frederiksgade (Frederiks Street) - and passed the Amalienborg complex - with the axis line ending at the newly built Opera house. 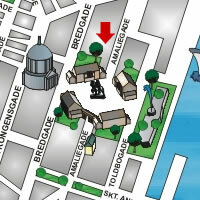 The Long axis was drawn alongside Amaliegade (Amalie Street) - and via the octagonal square through the colonnade that connects two palaces and further on Amaliegade. The Marble Church was the prime monument stating the 300 year jubilee of the Oldenborg line of Royalties. The foundation stone of the Marble Church was laid by King Frederik V in 1749 - but due to many budget cuts the construction was slowed down chiefly as financial resources were limited. 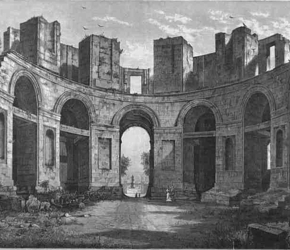 The monumental church was left incomplete and stood as a ruin for nearly 150 years - as illustrated here in 1868. The Marble Church was completed and inaugurated in 1894 - after 150 years and financed by industrialist Carl Frederik Tietgen. The Church has the largest dome in north Europe with a span of 31m. The dome rests on 12 columns and the inspiration of the church design was probably the Pantheon in Rome. The building of the four palaces started in 1750 and in 1754 the two first rococo buildings called Moltke's Palace and Levetzau's Palace were completed at the west end of the Amalienborg compound. After completion and in the same year the court architect Nicolai Eigtved died and was replaced by his colleague Lauritz de Thurah, who continued the work and finished the two projected palaces in 1760 named Brockdorff's Palace and Schack's Palace. The most expensive of the four new palaces was Moltke’s Palace (later King Christian VII's Palace) - presenting the most extravagant interiors. A memorial plate for the court architect Nicolai Eigtved - who worked out the plan of Frederiksstad is placed on the wall of King Christians VIII's Palace on Frederiksgade. 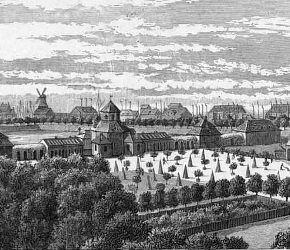 The Amalienborg Palaces in 1843 - seen from the north-eastern end with the equestrian statue of King Frederik V- and glimpse of the uncompleted Marble Church in the back. 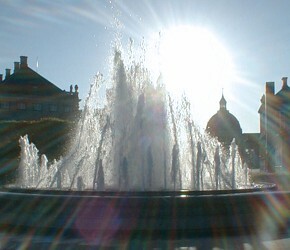 The Amalienborg square was a popular outing place for Copenhageners - and at that time the reigning King was Christian VIII - who resided in Levetzau's Palace (the visible palace to the right - beside the Marble Church - and later named Christian VIII's Palace. 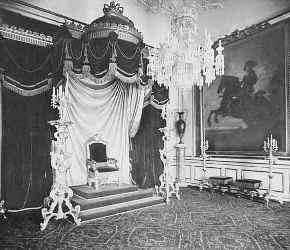 The Throne Room in Christian VIII's Palace from 1802 created by Nicolai A. Abildgaard. Actually - King Christian VIII - who gave name to the palace - was the last Danish Monarch to be anointed and crowned as King in 1839, as the coronation ceremony was abolished after he had succeeded the throne. The Crown Jewels and the Danish Crown Regalia are kept safely at Rosenborg castle and are displayed for the public. The Owner of Moltke’s Palace and head of the Danish Asiatic Company as well as Lord High Steward A. G. Moltke commissioned the equestrian statue of the founder of Frederiksstad and the Amalienborg palaces King Frederik V, which is placed in the centre of the octagonal square. The French sculptor Jacques-Francois-Joseph Saly was given the task in 1753, and the equestrian statue was completed and finally unveiled in 1771 - unfortunately - the King died in 1766 after only 43 years of life and 20 years of reign - 5 years before the equestrian statue of him was inaugurated. Thanks to a great donation from the A.P. Møller and Chastine McKinney Møller Foundation the statue was restored in 1998 - and brought back to its original glory. 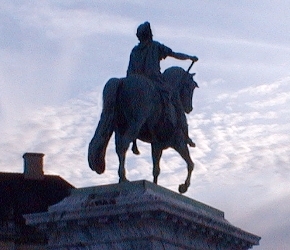 The equestrian statue of King Frederik V placed in the centre of the octagonal square at Amalienborg. The French sculptor Jacques-Francois-Joseph Saly took nearly 12 years to create the monument and the statue was finally unveiled in 1771. The colonnade between Christian IX's Palace and Christian VII's Palace was erected in 1795 to connect the royal families. The eight Ionic columns are constructed of solid painted wood and designed by the royal architect Caspar Frederik Harsdorff. The colonnade between the newly occupied estates Moltke’s Palace -residence of King Christian VII and Schack’s Palace - residence of the Crown Prince was designed by the royal architect Caspar Frederik Harsdorff and erected in 1794-1795 to connect the royal families and their residences. The eight Ionic columns are constructed of solid painted wood and formed as pilasters in ancient Greek architecture. In 1794 the royal residence Christiansborg Palace was raised by heavy fires and the reigning King Christian VII (1749-1808) - ruled Denmark and Norway 1766-1808) and his family became homeless - which made the King acquired the two empty Amalienborg estates - Moltke’s and Schack’s Palaces. The royal family moved into the palaces within a few days after the catastrophe at Christiansborg. The first Christiansborg Palace from 1745 was the Royal residence in Copenhagen and was destroyed by a fire in 1794 - while King Christian VII resided in the palace. The Royal family became homeless and moved for the first time to the private Amalienborg mansions - which were fortunately unoccupied and ready to move into. 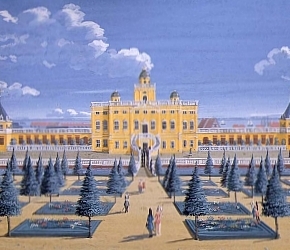 The first mansion that was acquired as a Royal residence by King Christian VII in 1794 - was Moltke's Palace - later renamed as Christian VII's Palace. 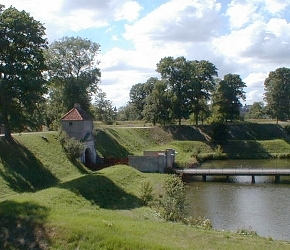 The palace beside called Schack's Palace became the residence of Crown Prince Frederik (6) - and was connected by a long colonnade of wood in 1795. From the date that the King achieved the first two Amalienborg palaces in 1794 and later when the two other palaces became permanent residences for royal families - the four mansions changed names and status as royal palaces, and over the years various kings and Queens with their families have resided in the four different palaces. It is a tradition that each palace ranks on shift as official royal residences - when a reigning monarch resides in the preferred palace. Moltke’s Palace nearest the Marble Church, changed name to King Christian VII’s Palace and was the first palace that was assigned for the royal family. Since then and after the death of King Christian VII - Christian VII’s Palace – named after the King - was used for the Royal Household and later in 1852-1885 as administration building for The Ministry of Foreign Affairs. Since 1885 Christian VII’s Palace is used to accommodate prominent guests and for royal receptions and ceremonial purposes. King Frederik VII is the only monarch, who has lived in the palace permanently. For a short time Crown Price Frederik (IX) and Crown Princess Ingrid lived in the palace - as well as her daughter Crown Princess Margrethe (Queen Margrethe II) and her husband - Prince Henrik. Both the exterior and interior at King Christian VII’s Palace was restored 1982 - and the palace and state rooms are open for visitors on a regular basis in the summer season. 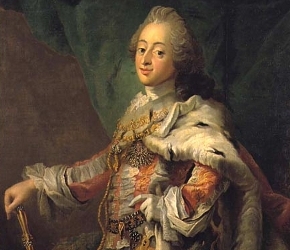 King Christian VII was the first monarch, who resided at the Amalienborg complex in Moltke’s Palace later called Christian VII’s Palace. 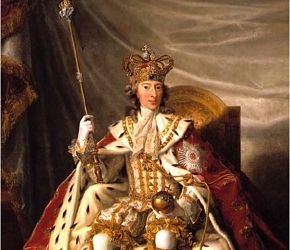 The King is here portrayed in 1789 by Jens Juel in his coronation robes together with the Crown Jewels and Regalia. The King is wearing the Crown of the Absolute Monarchs created by Paul Kurtz in 1670 for King Christian V and later used by the following Kings up to Christian VIII. The Crown is still in use - on the catafalque of a deceased sovereign. 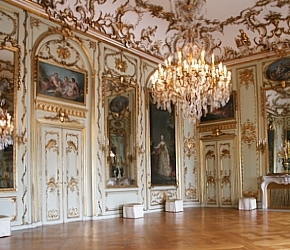 The Knights Hall or Great Hall at Christian VII's Palace from 1754 is one of the most decorated and lavishing rooms of the four Amalienborg palaces. This palace was the most expensive at the time it was built - and had the most extravagant interiors and was furnished with the greatest magnificence in the finest Rococo style. Since 1885 the property has been used for royal receptions - and to entertain and accommodate prominent guests as well as foreign heads of states. Schack’s Palace changed name to Christian IX’s Palace and located near the waterfront and Amalie Garden. The Palace was the second palace acquired by King Christian VII after the fires of Christiansborg Palace. 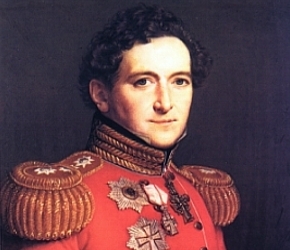 The Crown Prince and later King Frederik VI (1768-1839) - ruled Denmark 1808-1839 and Norway 1808-1814) was resident here, and after his death in 1839 the Supreme Court and the Ministry of Foreign Affairs used the royal premises. The former monarch and Regent King Christian IX (1818-1906) – ruled Denmark 1863-1906) entitled "Europe’s father-in-law" - and his Queen Louise moved from the Yellow Palace - just a few blocks away - into the palace in 1863. 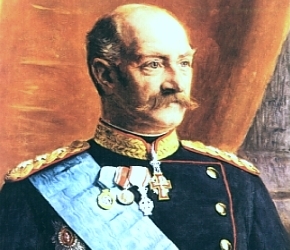 King Christian IX is the first Monarch of the Glücksborg line and the palace is named after the King. Finally and since 1967 - King Christian IX’s Palace has been the royal residence for the present reigning monarch Queen Margrethe II of Denmark and the Prince Consort Henrik. King Christian IX’s Palace is not open for visitors. 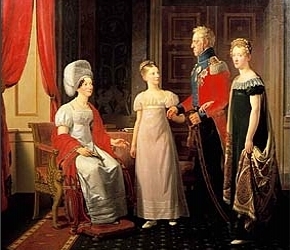 Crown Prince Frederik - later King Frederik VI and his family in 182 - was the first Royal family - who move into Schack's Palace in 1794 - later named Christian IX's Palace - after the fires had raised their home at Christiansborg Castle. The Kings favourite residence was Frederiksberg Castle located 3 km outside of Copenhagen, where his consort Queen Marie died in 1852. Since 1967 the palace has been the royal residence of Queen Margrethe II and Prince Consort Henrik. King Christian IX - "Europe’s father-in-law"
King Christian IX (picture) moved from the Yellow Palace beside Amalienborg to Schack's Palace in 1863 with his consort, Queen Louise and family. The Schack's palace was renamed after him. The King is the first monarch of the later Glücksborg Dynasty and was titled "Europe’s father-in-law" - as four of his children became monarchs and one grandchild King of Norway. 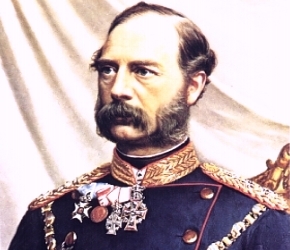 Most of Europe's reigning and ex-reigning royal families are direct descendants of King Christian IX. Brockdorff's Palace changed name to Frederik VIII's Palace and situated in the northeastern end of the square and near the Amalie Garden and harbor area. The palace was acquired by King Frederik V in 1765 - and in 1767 the palace housed the Military Academy also called the Army Cadet Academy (Landkadetakademi). The Naval Cadets took over the property in 1788 and in 1827 the Military Academy was closed, when King Frederik VI decided that his daughter princess Vilhelmine and Crown Prince Frederik - later King Frederik VII – the last Oldenborg King and the first constitutional Danish monarch (1808-1863 - King of Denmark 1848-1863) should reside at Frederik VIII's Palace after their wedding - and after a completely restoration of the royal estate had been accomplished. In 1869 Crown Prince Frederik - later King Frederik VIII (1843–1912 - King 1906-1912) moved into the palace, which was named after the King. In 1934 Frederik VIII's Palace became the home for Crown Prince Frederik and Crown Princess Ingrid and later the royal residence - when the Crown Prince succeeded the throne as King Frederik IX (1899–1972 - King 1947-1972). The admired Dowager Queen Ingrid lived here until her death in 2000. The Palace is currently undergoing a total renovation and face lift to be the residence for the next generation of royalties - namely Crown Prince Frederik (X) and Crown Princess Mary. Brockdorff's Palace was one of the first Amalienborg palaces - which was acquired in 1765 by King Frederik VI - and later used to house the Military Academy. Several members of the Royal family live in the palace until Crown Prince Frederik moved in with his family in 1869. When the Crown Prince became King Frederik VIII in 1906 (picture), and second Glücksborg monarch on the Danish Throne - the palace was renamed after him. 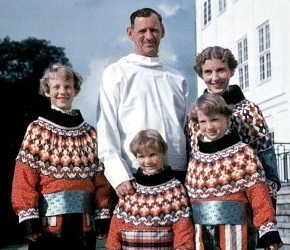 King Frederik IX with his consort, Queen Ingrid and the princesses Margrethe (Queen Margrethe II), Anne-Marie (Queen Anne-Marie of Greece) and HRH Benedikte in 1952 all dressed in national costumes from Greenland. King Frederik IX lived in Frederik VIII's Palace from 1934 until his death in 1972, and the Dowager Queen Ingrid lived here until her death in 2000. King Frederik IX was the fourth Glücksborg monarch on the Danish throne. After the renovation of King Frederik VIII’s palace for over DKK 130 million in 2010 - the Crown Prince Couple invited everybody to experience the renovated and redecorate palace - and since - nearly a half million visitors has seen a modern home with new fine art that is custom-made especially for the new modernize palace - as well as the restoration of the indoor architecture. The new generation of royalties has entered a top modern estate in historical surroundings - as their new winter residence. The Crown Prince Couple and family have moved into King Frederik VIII’s Palace - and their new home at this Amalienborg Palace is right beside Copenhagen's waterfront and the Amalie Garden. After the renovation of King Frederik VIII’s Palace - nearly a half million visitors - invited by the Crown Prince Couple - experienced the refurbished royal premises at this Amalienborg Palace. 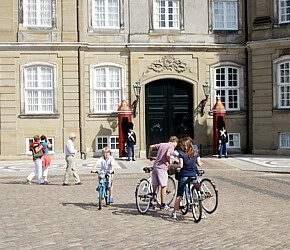 The Crown Prince Couple and family did receive the key to King Frederik VIII’s Palace at Amalienborg in October 2010 - and have moved into their new home. The Royal split flag will once again rise over the palace building - that is the only palace in the Amalienborg complex with a clock on the fronton of the building. 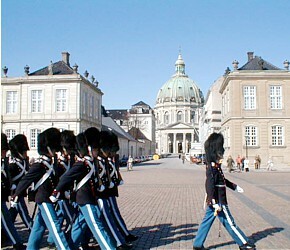 King Frederik VIII's Palace is the Royal residence of the Crown Prince Couple and is not open for visitors. 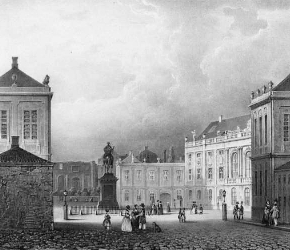 Levetzau’s Palace changed name to Christian VIII's Palace and is situated at the northwestern end of the octagonal square and near the Marble Church. The Palace was bought by the Heir Presumptive Frederik in 1794, who had it modernised in new French Empire style and used it as his residence until he died in 1805. The Crown Prince Christian, who grew up in this palace - and later crowned as King Christian VIII (1786-1848 - King 1839-1848) - and gave name to the palace. After King Christian VIII died in 1848 and Dowager in 1881 - the Ministry for Foreign Affairs used the premises until 1898. Then the palace was selected as residence for Crown Prince Christian (X) and Crown Princess Alexandrine - the later King Christian X (1870-1947 - King 1912-1947). After the death of King Christian X - the palace was disposal for his son and Heir Presumptive Knud. The Palace went through a complete refurbishment in the 1980s and was the home and state rooms of the present heir to the throne Crown Prince Frederik. King Christian VIII (picture) grew up in Levetzau's Palace, which was bought by his father the Heir Presumptive Frederik in 1794. When crowned as King in 1839 the palace was renamed Christian VIII's Palace. The King was the last Danish monarch to be crowned, as the coronation ceremony was abolished after he had succeeded the throne. King Christian VIII started the process of given Denmark a free constitution, which was fulfilled by his son and last Oldenborg monarch King Frederik VII in 1849. Crown Prince Christian (X) and Crown Princess Alexandrine moved into Christian VIII's palace in 1898 after their wedding. The later King Christian X lived in this palace with his consort Queen Alexandrine until his death in 1947. 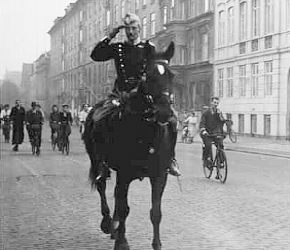 During the German occupation of Denmark the King took a daily ride on horseback through his city and won much admiration and sympathy among the Danes. King Christian X was the third Glücksborg monarch on the Danish throne - and was also known for his impressive 199 cm height. There are several legends about King Christian X during the Nazi occupation of Denmark - 1940-1945. In 1942 - Adolf Hitler sent King Christian X a very long telegram congratulating him on his 72th birthday. King Christian X’s reply telegram was very simple with the few words - "Meinen besten Dank". Chr. Rex (My best thanks - King Chr.). This disrespectful message outraged Hitler and he immediately recalled his ambassador from Copenhagen and expelled the Danish ambassador from Germany. Another popular legend is the one of the royal flag on the top of Amalienborg Palace. The Nazis wouldn't let King Christian X fly the Danish flag at his palace - and told him that if it wasn't taken down the Nazis would send a soldier to pull it down. 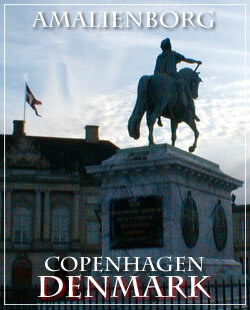 King Christian X replied - if that was the case he would send a Danish soldier to raise it again. The Nazis replied that they would shoot that soldier - and the King replied - "that Danish soldier will be me". 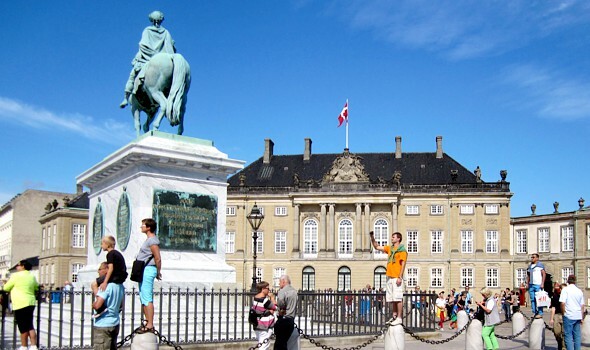 And throughout the war and 5-years of Nazi occupation the royal Danish flag flew at Amalienborg. 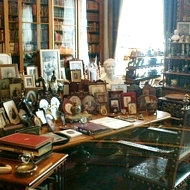 The office and study of King Christian IX at the Amalienborg museum. 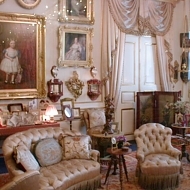 Living room of King Christian IX and Queen Louise at the Amalienborg museum. 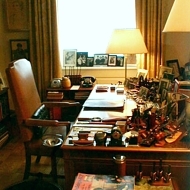 The office and study of King Frederik IX at the Amalienborg museum. King Christian VIII's Palace houses the Amalienborg museum displaying the history of the Glücksborg Dynasty and their private royal apartments from 1863-1972 including the original furnishings. The museum is open for visitors all year round and there are guided tours to the "Bel-etage" (Gala-Hall) in King Christian VIII's Palæ on Wednesdays and Sundays. Amalienborg Palace is always guarded day and night all year round by The Royal Danish Life Guards - as this special regiment has had the closes connection to the Royal House since 1658. The brigade was established by King Frederik III (1609-1670 - ruled Denmark and Norway 1648-1670) - and the main duty was to protect the King and the Royal Castles and Palaces as well as being present during ceremonial occasions and Royal receptions. Changing of the Guard is one of the oldest and most common of all royal ceremonies - a new guard exchanges duty with the Old Guard to continue their operational commitments - and the handover is mainly accompanied by a the Royal Guards music band playing traditional military marches. Kongevagt - The Kings Guard - is exercised when the Queen is in residence. After changing of the Guards the ceremonial act continues by leaving the drum and regents flag on the drill ground in the day time - to announce that the Queen is in residence. 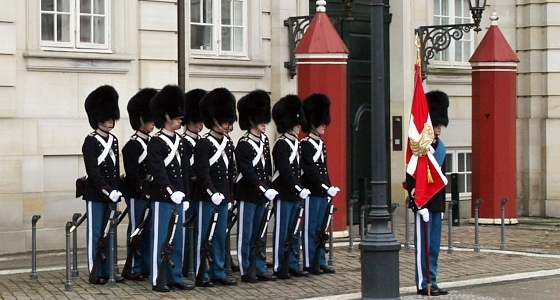 The Royal Danish Guards - Founded in 1658. Amalienborg Palace. Kongevagt - The King’s Guard - is exercised when the Queen is in residence - and will be accompanied by the Band of the Royal Danish Life Guards. The guards will departure from Rosenborg Castle at 11:30 - and end at Amalienborg palace at 12:00 - where changing of the guards takes place. After the parade and shift - the Guards leaves the drum and the Regents Flag on the drill ground in the daytime at King Christians VII’s Palace beside the colonnade. 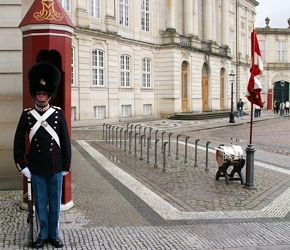 Løjtnantsvagt - The Lieutenant Guard - is exercised when The Prince Consort Henrik - or the Crown Prince as well as Prince Joachim is reigning in absence of the Queen - are in residence at Amalienborg. The guards will be accompanied by the Band of the Royal Danish Life Guards and will departure from Rosenborg Castle at 11:30 and end at Amalienborg palace at 12:00 - where changing of the guards takes place. After the parade and shift - the Guards only leave the drum on the drill ground in the daytime at Christians VII’s Palace beside the colonnade. Palævagt - The Palace Guard - is exercised when the Crown Prince or Prince Joachim reside at Amalienborg, or when the palaces are unoccupied by members of the royal family. 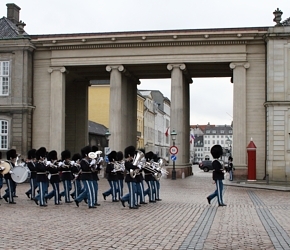 The guards will march from Rosenborg Castle at 11:30 through Copenhagen without any musical band or accompaniment and end at Amalienborg palace at 12:00 - where changing of the guards takes place. 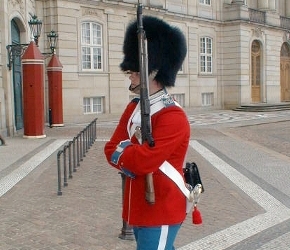 In connection with ordinary duties for the Royal House - The Royal Danish Life Guards are dressed in the original dark blue field uniform from 1848 - with a tall fur bearskin cap from 1805 - which weighs nearly 4 kg. together with a symbolic Guards sabre and a standard army rifle M/95. The dark blue uniform of the Life Guards while they are on ordinary guard duty is dated back to 1848. The drum and flag indicates that the Queen is in residence. On special occasions and when specific events within the Royal House are celebrated - the Guards will wear the red gala uniform - which dates back to about 1660. On special occasions and other ceremonial matters within the Royal House - the Royal Danish Life Guards will wear the red full-dress uniform dated back to about 1660. Visitors at Amalienborg Palace will experience the Royal Danish Life Guards in their rich coloured red full-dress uniform - when birthdays - weddings - birth - christening - anniversaries etc. are celebrated within the Royal House and by the Royal family members involved. When the Queen and other members of the royal family are in residence in any of the palaces the swallow-tailed Danish flag (Dannebrog) will be flying over the palace concerned. The Queens flag has the royal coat of arms in the central field and special versions of the Royal swallow-tailed flag with different monograms represent each family member of the Royal House. The Royal Yacht Dannebrog has been the official and private residence of Danish monarchs and the Royal House since 1931. Since, the yacht has travelled over 300,000 nautical miles - mainly visiting ports in Denmark, Greenland and the Faroe Islands. 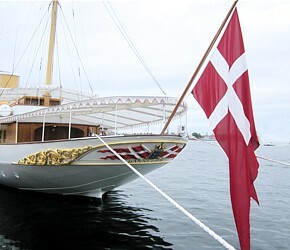 The swallow-tailed Danish flag (Dannebrog) is flying, when the Royal family is residing on board. According to the myth - the Danish flag fell down from the sky in June 1219 in Estonia. 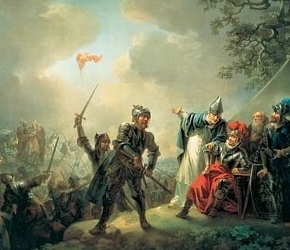 With the flag in his hand, King Valdemar II won the battle at Lydanise near Tallinn. The painting of the event is illustrated by Christian A. Lorentzen in 1809 - and displayed at The Danish National Gallery. The legend of the flag is very popular among Danes. The national Danish flag (Dannebrog) is the oldest national flag in the world dating back to the 14th century. According to the myth the Danish flag fell down from the sky in June 1219 as a revelation for the Danish King Valdemar II - called Valdemar the Victorious (1170-1241 - King 1202-1241) during his crusade to Estonia - and with the flag in his hand - King Valdemar II won the battle at Lydanise near Tallinn. The King commanded the historic flag to be the Danish National flag. The legend of the flag is very popular among Danes. The Danish flag (Dannebrog) was once the flag of Norway too - during the Danish-Norwegian Union until 1821. Norway acquired their own National flag by putting a blue stripe in the white cross - when they became an independent nation. The design of the Danish flag with the Christian cross was also later adopted by the other Nordic countries like Sweden - Finland - Iceland and the Faeroe Islands. Amalienborg Palace is located near the Marble Church - Amalie Garden - The Yellow Palace - The Royal Playhouse and opposite the Opera House alongside the waterfront. Amalienborg Museum - Private apartments of the Glückborg Kings from 1863-1972. Quarters for foreign heads of state. Guided tours in July and September.